PANAJI: With fishing ban coming into force in the state as the southwest monsoon approaches, and nearly 80 per cent of the trawlers calling off operations, there is a decline in the availability of fresh fish in the markets. Fish being an important part of diet of Goans, who cannot do without it, many people have now started going in for dry fish during the rainy season thus triggering high demand for it. To meet the growing demand for the dry fish, it is being procured in large quantities from places like Karwar bordering South Goa and Malvan bordering North Goa. “First of all, there is hardly any fish available for drying in Goa and as there is a demand for this type of fish since several Goans stock dry fish during the rainy season, dried fish is brought from places like Karwar, which has a big dry fish market. Various varieties of dry fish are available in the Karwar market,” said a fish vendor. He said that nowadays less quantity of fish is available for drying in Goa. “The beaches where the fishermen used to traditionally dry fish are today crowded with tourists and shacks and hardly any space is available for drying fish on the state’s beaches,” he said. Dry fish is cheaper in Karwar as compared to that available in the Goan markets and while seven medium-sized dry mackerels are priced at Rs 100 in Goa, one can get around 20 to 25 such dry mackerels for the same price in Karwar. Hence, many people from the state’s bordering villages go to Karwar for their share of the dry fish. 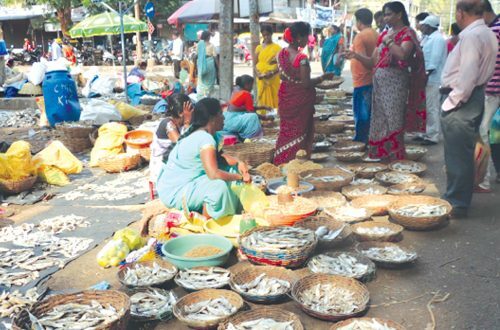 Some vendors buy dry fish from Karwar and Malvan on wholesale basis and sell the same in Goa, making good profit, said sources. Many Goans relish dishes made from dried mackerels and ‘galmo’ or dried tiny prawns. Drying of fish is traditionally carried out in the sun. During summer, the fish is dried and stocked for the monsoon when hardly any fresh fish is available owing to the annual fishing ban. “My family loves dry fish, especially dried mackerels and prawns. We relish the mouth-watering ‘kismur,’ which is prepared from dried prawns, and dry mackerel curry and rice. The dry fish stocked for the monsoon helps a lot as hardly any fresh fish is available in the market and one does not feel like going to the market when it rains heavily,” said a local woman Manjiri.